NEXT | Hearthstone Tavern celebrates a milestone with free stuff! And it’s to look good. It’s definitely not because lights are too bright this morning. Definitely not, because these sunglasses really do look good. Are you buying that? I hope you’re buying that. Let’s do the Queue, people. Q4tQ: I’m someone who enjoyed Diablo 3’s gameplay when I had the plot driving me forward, but lost interest about a month after I had finished the story and haven’t played since. Does Diablo Immortal have much going on in the story department, or is it too early to tell? Diablo Immortal, at least as the developers describe it, is all about story. There’s a lot that happened in Sanctuary after Diablo 2 and before Diablo 3 — Malthael decided to destroy humanity, Cain met Leah, Tyrael fell from the heavens. Diablo Immortal will tell these stories and more beside. What we don’t know is how those stories will be told. Though the team was very enthusiastic about the opportunity to tell these stories, the demo on the show floor was all about gameplay. We don’t yet know what storytelling in Immortal will look like — but it will be a key part of the game. QftLiz: What Disney movie would you want to see redone with Overwatch characters instead of the original cast? Wow. This question is incredibly hard because I honestly think you could remake a lot of Disney movies like this and they would be amazing. Hammond: This one’s easy, because he’s basically already Stitch from Lilo and Stitch. Though I can’t figure out who would play Lilo, I think this would be almost exactly the same movie. Bastion: The Little Mermaid. He’s the mermaid, guys. Sombra: I am already imagining Alice in Wonderland, with Alice’s lines done by Carolina Ravassa. Mei: This has to be Sleeping Beauty, right? Except instead of a prince she’s woken up by her own adorable baby robot. Widowmaker: I’m thinking a genderswapped Beauty and the Beast where Widowmaker is the Beast. And there’s not actually a romance. Maybe there’s not even a Beauty. She just hangs out in her castle and shoots annoying villagers who get too close. I guess that’s not much of a story, but I call ’em like I see ’em. Ana: This is definitely a Mary Poppins story. I don’t know how that works, but as Team Mom, Ana has to take the Mary Poppins role here. Tracer: She’s totally Peter in Peter Pan. Reinhardt: Just imagine a world where every character in every movie were voiced by Darin De Paul. Just imagine it. There are plenty of other amazing possibilities because I’m sure every possibility would be amazing. But this list is a start. With the way WoW Classic is being portrayed, do you think that we will see the rise of gold farmers and sellers? Without the gold provided by daily quests, world quests and missions the only way to make gold in vanilla was farming mats. I’m very curious about this. While there are still gold farmers, making gold isn’t that hard these days — and if you don’t have time to make it yourself, you can buy it directly from Blizzard. Back in the day it was a massive effort to get 100 gold to buy an epic mount at level 60. Earning gold meant grinding, and because grinding wasn’t a lot of fun, there was a notable demand to buy gold. This didn’t just mean that some players had easier access to gold than others: it meant that gold farmers were all over the game, swarming over routes where you could most efficiently farm mobs for silver and loot to build up enough cash to sell. So if you, a simple player, wanted to farm gold for yourself rather than spend actual money to buy it, you would have to compete with the gold farmers who knew the best, most profitable routes for farming better than you did. It was really a damned if you do, damned if you don’t situation. Presumably in WoW Classic it will still be very difficult to make gold. Presumably WoW Tokens won’t exist. And if you can take those two things as a given… gold farmers also seem to be a given. Q4tQ: I can’t find any info on types of servers in classic. I guess they’ll go for the old model (pve, pvp, rp-pve and rp-pvp) for the sake of fidelity, but can’t find anything in that. Did they talk about it? 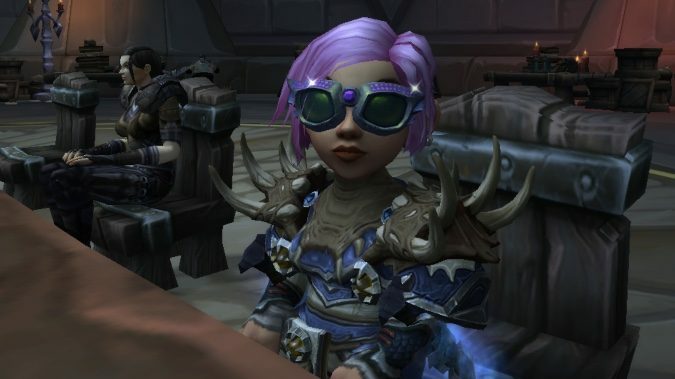 It’s easy to forget, but a ton of the little conveniences we know and love in World of Warcraft were actually added after launch. Sometimes well after launch — like RP-PVP servers, which weren’t added until September 2005, almost a year after launch. Mekkatorque would be such a fantastic Lich King that we should really do everything in our power to prevent him fro becoming the Lich King. He would streamline scourge production with factory-line efficient and build mechanical augmentations to offset their weaknesses. This is an opportunity for endless experimentation, endless construction… it’s an engineer’s paradise. And on top of that, Mekkatorque would do this while acting somewhat hapless, so you would never suspect him of being the source of such evil. And that’s all for now, my friends! Come back tomorrow with more questions and more answers, courtesy of Adam.